﻿ Group B01 | Project Overview | Science of Slow Earthquakes - Grant-in-Aid for Scientific Research on Innovative Area, MEXT, Japan. Recently revealed diversity of fault slips is considered to result from the heterogeneity of frictional characteristics along the plate interface and to reflect structural/environmental factors such as geometry, physical properties and fluid distribution. Group B01’s major target area is the Bungo Channel and its surrounding areas where diversified fault slips occur simultaneously. We will challenge to achieve comprehensive understanding on structure of the plate interface and their surrounding areas and to detect changes in the structure associated with fault slips in the areas using all available seismological/electromagnetic methods. We try to understand the environment in which slow earthquakes occur from comparisons between the detailed structures obtained by Group B01 with regions of slow earthquake occurrences revealed by Groups A01/ A02, and further by referring to the information on material properties of the plate interface clarified by Group B02. We will compare our results with those of other subduction zones to identify similarities/differences of structural factors. From these results, we aim at constructing a physical model on the basis of comprehensive understanding of fault slip mechanisms. Successful construction of such a physical model would make our studies shift to a new research stage for estimation of the strain-accumulation processes between the plates and for clarification of mechanisms of fault slip generation by monitoring the structure around the fault plane. We will acquire seismic/electromagnetic data by conducting onshore and offshore surveys and observations, and reveal details of seamless 3-D structures and physical properties around the plate interface extending from the trench axis to the area of deep low-frequency tremor occurrences. For this purpose, we will perform structural analyses in conjunction with data from the existing seismic network in cooperation with Group A01. In addition, we plan to conduct a large-scale active source seismic surveys on land in western Shikoku and in the offshore of the Bungo Channel. We also plan to improve electromagnetic observation network in Shikoku and Kyushu, and conduct marine observations using ocean bottom electromagnetometers in the Bungo Channel. Acquired observation/survey data will be utilized for the studies below. We will conduct tomography analyses using the records of both natural earthquake observation and active source seismic surveys to determine the 3-D seismic velocity/attenuation structure, to identify the material and its physical state, and to estimate the fluid contents. By investigating seismic waves reflected or P-to-S converted at discontinuities in seismic velocity structure such as the plate interface, we will try to resolve their geometry and physical properties in their surrounding areas. Involvement of fluid on various fault slips including slow earthquakes has been suggested. Structural analysis using electromagnetic methods is effective to determine fluid distribution. 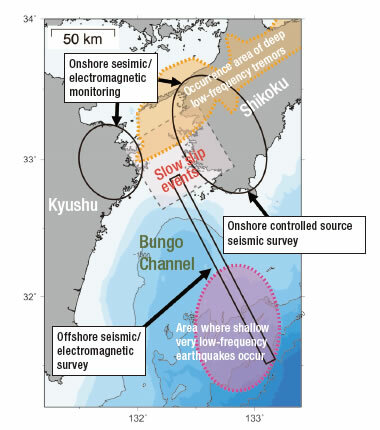 We intend to clarify the relationship between slow earthquake activities and fluid distribution as well as to reveal the 3-D electrical conductivity structure from observations in western Shikoku, eastern Kyushu and the offshore regions around the Bungo Channel. Figure 1. Areas of seismic/electromagnetic surveys, and monitoring in the area surrounding the Bungo Channel, which is the main research target area in this Research Project. Combining the findings on structural analyses from the above researches with spatiotemporal distribution of fault slip occurrences revealed from observations by Groups A01 and A02, and information on physical properties of the materials around the plate interface provided by Group B02 would help better understand relationship between the environment around the plate interface and motion along the interface. Then we will aim at constructing physical models of fault slips in cooperation with Groups C01 and C02.